Border Fine Arts has been producing The World of Beatrix Potter products since being granted a licence in 1987, since then the collection has grown to include many different formats. The artwork for each product is taken from the original illustrations from the Beatrix Potter stories. Presented in a branded gift box. Material: Ceramic. Not a toy or children's product. Intended for adults only. 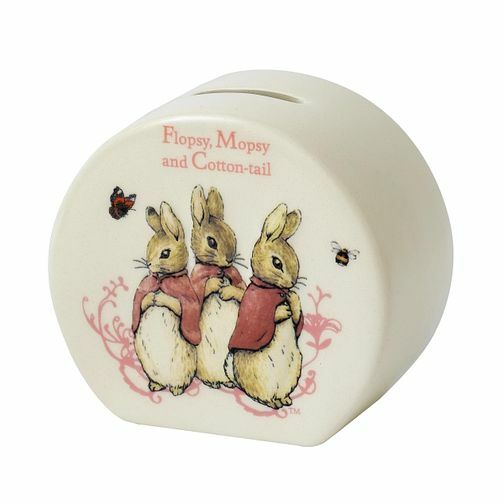 Peter Rabbit Flopsy, Mopsy & Cotton-tail Ceramic Money Bank is rated 5.0 out of 5 by 1. Rated 5 out of 5 by Anonymous from Lovely money box This is a really nice money box. Can be used for kids or adults-i bought it for myself and am very very pleased with it. The service from Samuels was very fast too.